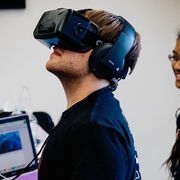 Vivace was born from several passions: A passion for music, a passion for Virtual Reality, and most of all a passion for teaching others. 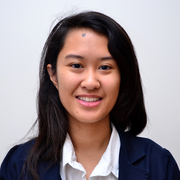 Only one member of our team was actually familiar with conducting or had a music background, but it was the willingness of the others to learn and take interest in the subject that made Vivace great. We wanted to help those who had no experience with musical ensembles or conducting to experience something new in a fun, unique, and exciting way. Conducting and leading an orchestra is certainly difficult, but when it's done right, it's an extremely rewarding feeling. 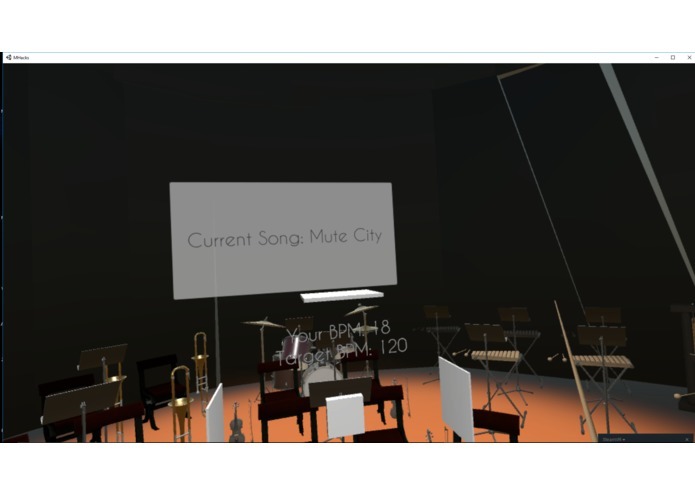 We felt that this subject could be gamified to reach a large audience, and perhaps to even help those who are preparing or practicing for actual conducting experiences. 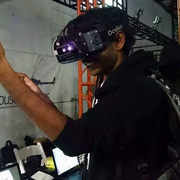 Vivace is an HTC Vive Virtual Reality experience, which means users can actually move around in the 3D space we created. 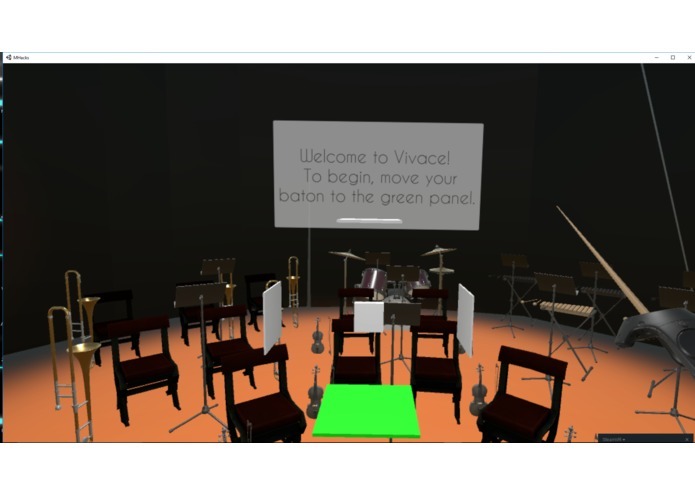 The game begins in a large concert hall with several attendees clapping, and the player will begin a tutorial on how to conduct using a baton. 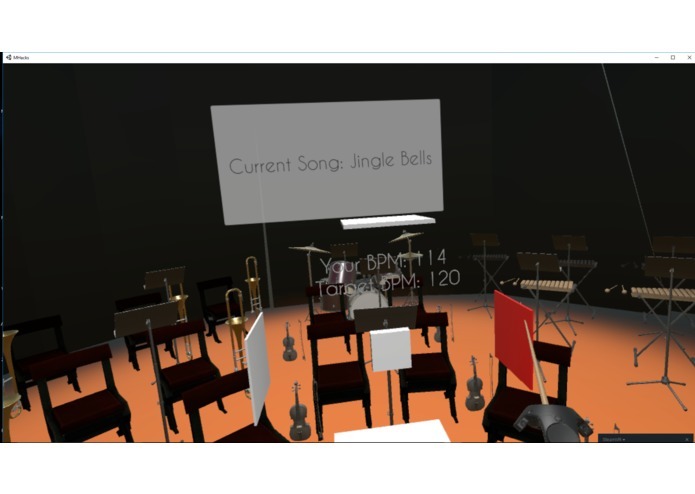 In real life, that user is actually holding an HTC Vive controller, but in the Virtual World it will show them in front of an orchestra, holding a baton, ready to start creating music. The tutorial consists of several lessons on tempo, movement, and how to effectively conduct. We used colored panels to show where the player should hit with their baton on certain beats, and these panels light up on their respective beats. In this sense, we made conducting into a fun rhythm game. 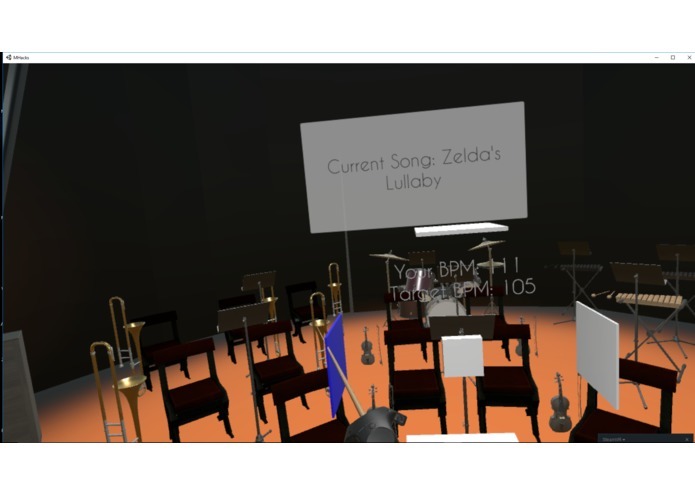 However, once the tutorial is over and the player was walked through the basics, we let them actually conduct real music. The panels will light up according to the beats-per-minute of actual songs, and the conductor must keep up and hit the correct panels on the correct beats in order for the music to make sense. 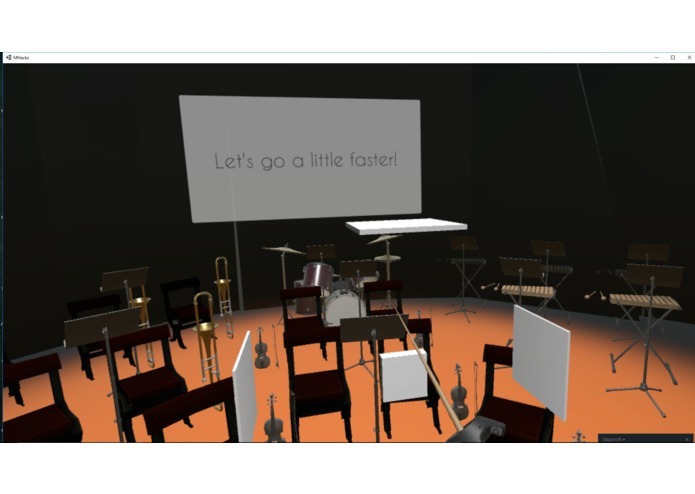 If the user is conducting too slow, the orchestra will play very slowly and will sound distorted. If the user is conducting too fast, the music will be high-pitched and sped up. The goal is to find that "Sweet spot" where the player's beats-per-minute match that of the real song. We have several songs available in this demo: Ode to Joy, Amazing Grace, Zelda's Lullaby, Mute City, and Jingle Bells. Each one is different and will offer a new challenge. We built Vivace using the Unity Game Engine and the HTC Vive, which means all our programming was done in C#. 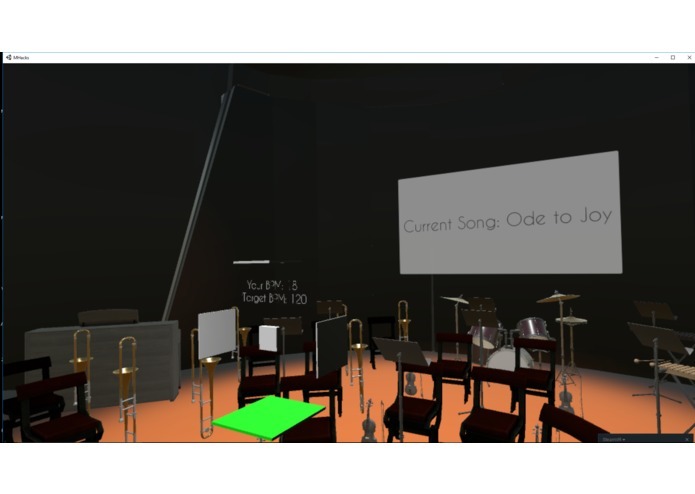 The 3D models (Including the concert hall and the baton) where made using Autodesk Maya. Vivace was not our original idea for the hackathon, and we actually only pivoted to it halfway through the event. We decided we wanted to take on a topic more lighthearted and fun than our original goal, and wanted to bring the same joy to others while also showing them a cool niche talent. By the end of our project, the entire team could conduct, regardless of experience! Half the fun of this project was working through it, testing it, and getting better ourselves as a proof of concept for what we were creating. Of course, being able to actually succeed at conducting was pretty rewarding too. 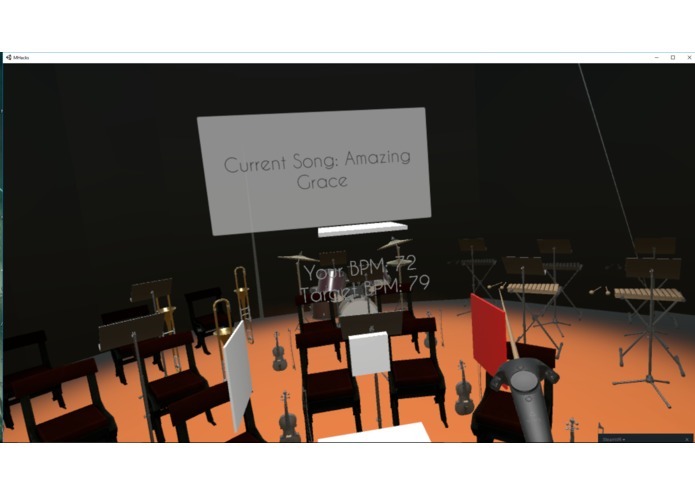 This was also our first ever music project, which we're quite proud of since we often tackle social good projects in VR, but have never quite delved into the fine arts. We learned some interesting drawbacks to audio in Unity, and had to adapt our strategy several times in order to build a game that entirely revolves around accurate and on-time, though not necessarily predictable, audio queues. In addition to this being a fun game to spread and share with others, we truly believe this application can be used in actual ensembles to help conductors, drum majors, or directors prepare and practice their conducting. It can especially be useful to students who are just learning how to conduct! I attempted automated beat detection and scaling music without pitch shifting. Both turned out to be difficult signal processing problems. 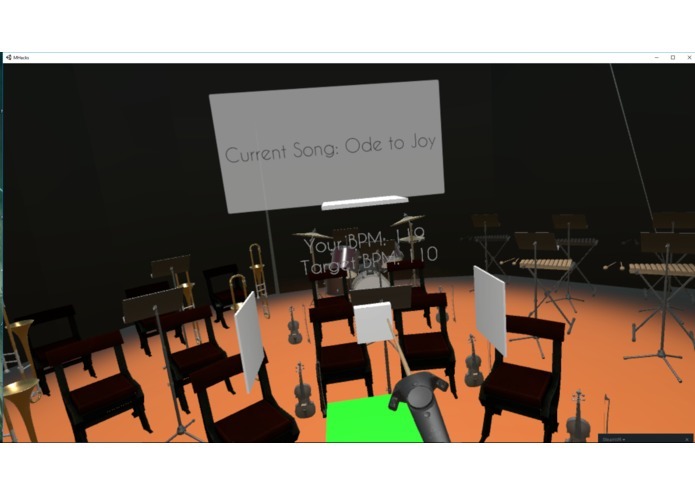 I built the orchestra hall and the baton 3D models using Autodesk Maya. 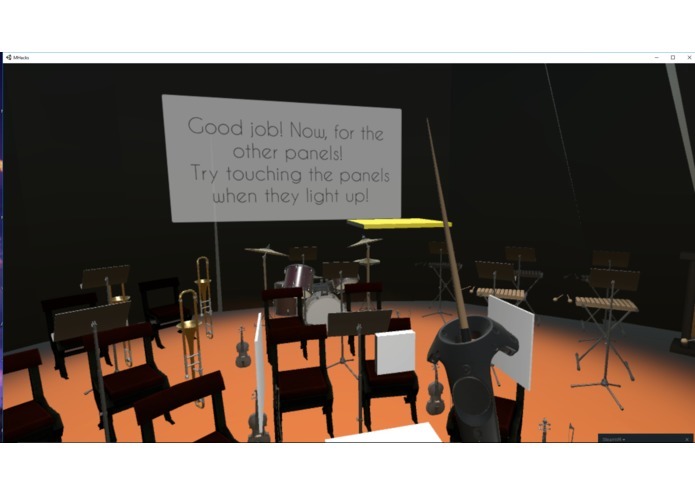 I also helped with testing and creating the atmosphere such as the instruments, chairs, and audience. Also helped implement a book feature for future music sheet use. I was the "musical" member of the team, and created the system that users interact with in order to conduct. This includes the tutorial, the conducting panels, the song playback, and most content centered around the musical aspect of Vivace.